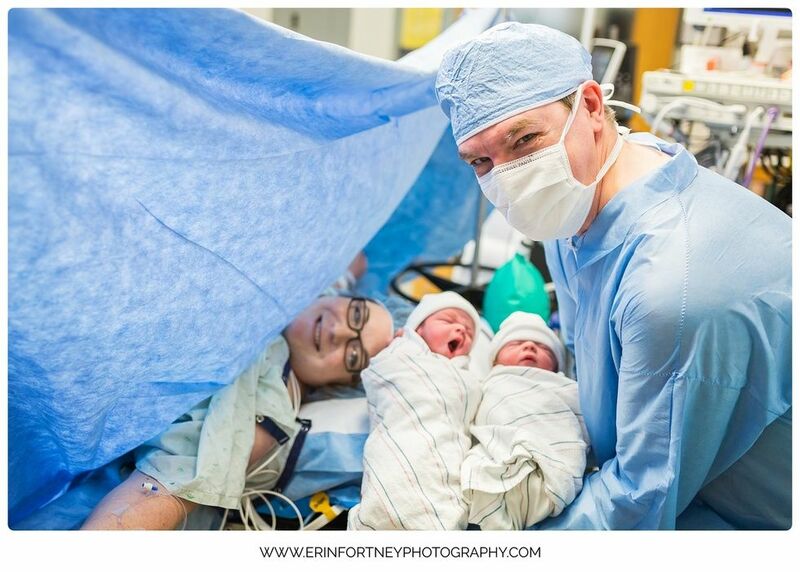 As pictures of her shirtless husband cuddling his newborn son have swept across the internet, Lesa Brackbill has been surprised by just how surprised some internet commenters have been to see a dad doing skin-to-skin with his babies..
To her, it was obvious that her husband, Brennan, would want to have skin-to-skin contact with the couple's twin boys after her C-section. It's something he did with their first baby, Victoria, as well, and the memory of her skin on his is something he will always cherish. 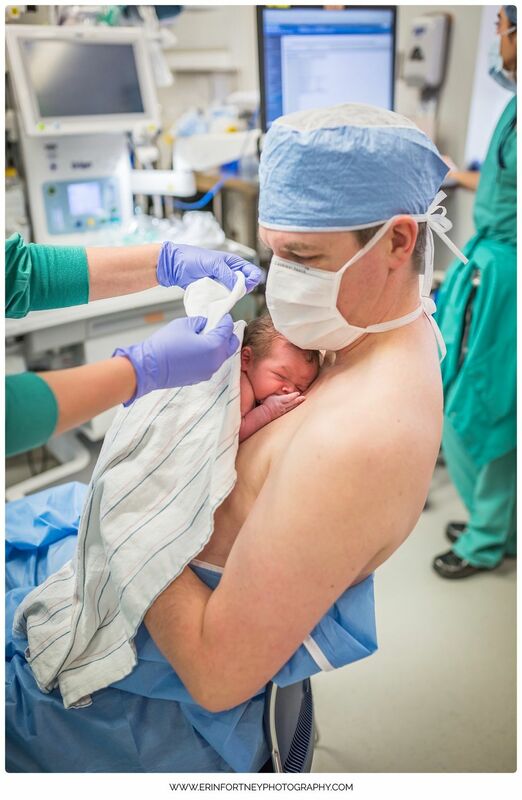 "He was so passionate about it because he loved the time he had with our daughter, doing skin-to-skin in the operating room," Brackbill tells Motherly. "We didn't expect to have a C-Section with her, it was just a spur of the moment thing, he agreed to do the skin-to-skin and then he loved it because he got to spend an hour with her when she was first born and they had a really good bonding experience." Research suggests "Kangaroo Care" cuddles after birth can help children go on to perform better in school and have preferable behavioral outcomes, and the impact is seen even decades after the cuddle sessions. Brackbill says she's so proud of her husband for making his intention for skin-to-skin contact known to hospital staff during her second C-section, and for giving each of their baby boys the post-birth cuddles they needed. "It is important because we can't hold our daughter anymore," she explains. While the couple is not responsible for their skin-to-skin story going viral (they credit their birth photographer Erin Fortney for that, as she shared the photos with Birth Becomes Her and they spread from there), they have been trying to attract attention to another story for awhile now, Victoria's story. The daughter Brennan held so tightly the day she entered the world left it just 20 months later, due to a terminal, degenerative nervous system condition called Krabbe disease. Brackbill describes the family's journey in her book, Even So, Joy: Our Journey through Heartbreak, Hope, and Triumph. "We want people to be aware of the disease itself, because we didn't know it existed, we didn't know we carried it and one in 125 people carry a genetic mutation that causes Krabbe. Newborn screening is so vitally important," she explains, noting that the twins are not impacted by Krabbe, and that newborn screening for the condition can allow children who are to get treatment early. In Tori's case, the diagnosis didn't come until she was six months old. Brackbill is happy that the viral photos of Victoria's father and brothers are helping spread the word about Krabbe, and celebrate her memory. "Our experience with her, our journey with her, only amplified our joy with them," she says. She hopes the images of her boys doing skin-to-skin amplifies the message medical professionals have been saying for years: Skin-to-skin isn't just for mama. When dads have the opportunity to provide their children with the touch they need, the bond can last beyond a lifetime.